The Foreign Ministry said North Korea could bring back its "pyongjin" policy of simultaneously advancing its nuclear force and economic development if the United States doesn't change its stance. Seoul: North Korea has warned it could revive a state policy aimed at strengthening its nuclear arsenal if the United States does not lift economic sanctions against the country. The ministry said North Korea could bring back its “pyongjin” policy of simultaneously advancing its nuclear force and economic development if the United States doesn’t change its stance. Ahead of his first summit with Moon in April, Kim said the country should shift its focus to economic development as the “pyongjin” policy had achieved a “great victory.” He also declared that the North would stop nuclear and long-range missile tests and close its nuclear testing ground. The North unilaterally dismantled the nuclear testing ground in May, but didn’t invite experts to observe and verify the event. 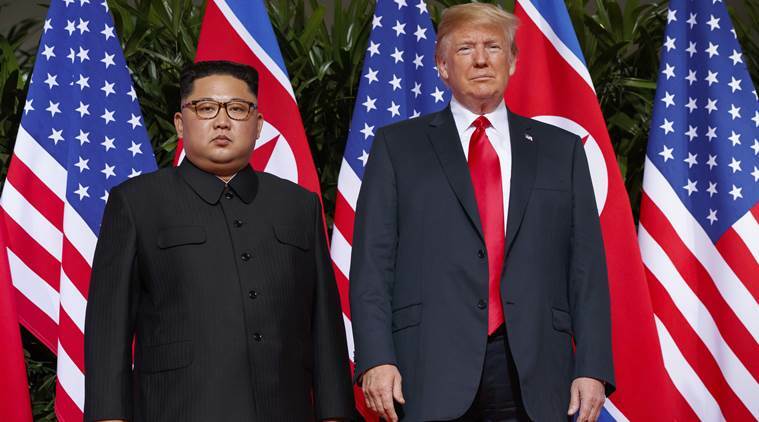 Friday’s statement marked the first time the North said it could potentially resume weapons tests and other development activities since Kim’s signaled a new state policy in April. “If the US keeps behaving arrogantly without showing any change in its stand, while failing to properly understand our repeated demand, the DPRK may add one thing to the state policy for directing all efforts to the economic construction adopted in April and as a result, the word ‘pyongjin’ may appear again,” the statement said, referring to North Korea by its official name, the Democratic People’s Republic of Korea. Moon has described inter-Korean engagement as crucial to resolving the nuclear standoff. A large number of South Korean CEOs accompanied Moon in his September visit to Pyongyang, when he and Kim agreed to normalize operations at a jointly run factory park and resume South Korean visitors’ travel to the North when possible, voicing optimism the international sanctions could end and allow such projects. But South Korea’s enthusiasm for engagement with its rival has also created discomfort in the United States amid growing concerns that the North is dragging its feet with its promise to denuclearize. South Korea last month walked back on a proposal to lift some of its unilateral sanctions against North Korea to create diplomatic space following Trump’s blunt retort that Seoul could “do nothing” without Washington’s approval.